Healthcare providers continue to ramp up their engagement with ENS, which enables coordinated care for approximately 30 million patients. BALTIMORE, MD. 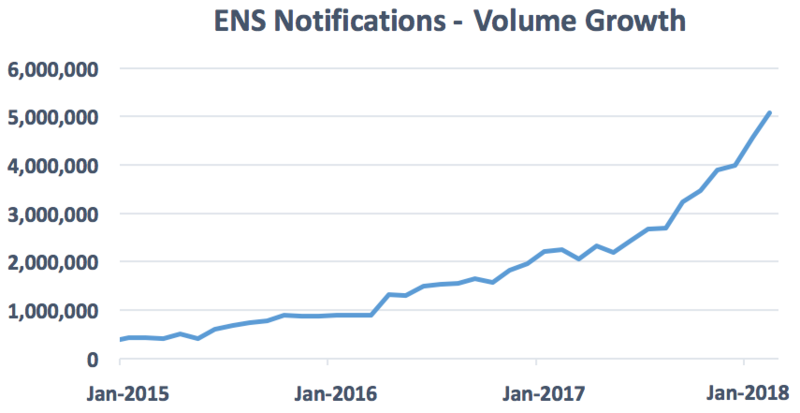 February 14, 2018—As Audacious Inquiry (Ai) expands to support growing demand for the company’s industry-leading real-time alerting and care coordination tool—Encounter Notification Service (ENS)—the company celebrates the milestone of delivering more than 5 million clinical event alerts per month. ENS alerts provide an array of benefits for care coordination. For example, they deliver a snapshot into a patient’s current status, visit history, and whether they have recently been admitted, discharged, or transferred between care settings. This insight helps physicians, nurses, and care coordinators provide timely follow-up care, or otherwise intervene within a hospital stay or ED visit. ENS also delivers opportunities to conduct transitional care management, thereby reducing readmissions and the total cost of care. Across the United States, there are 3,000 organizations sending and/or receiving notifications. ENS has come a long way since it first pioneered how to leverage available patient data from HL7 ADT (Health Level Seven, Admission, Discharge, Transfer) messages in 2013. Today, the ENS engine serves approximately 30 million patients and spans ten states and regions (Maryland, Florida, Delaware, Tennessee, West Virginia, Minnesota, California, Pennsylvania, Utah and Washington, D.C.). The technology is easily deployable and offers a more efficient and cost-effective way to coordinate care for hospitals, physician practices, health plans, accountable care organizations (ACOs), and patient-centered medical homes. To learn more, visit ainq.com/ens. Audacious Inquiry (Ai) is a health information technology and policy company that provides bold solutions for connected healthcare. Ai’s industry-shaping technology offers efficient and cost-effective solutions for care coordination; their nationally-recognized team-members provide actionable strategic consulting, and their services raise the bar for leveraging health data.